A podcast is a collection of Web-based digital media (e.g., audio, video) to which users can subscribe, thereby receiving new media content as it becomes available. The subscription functionality is made possible by a technology called Really Simple Syndication (RSS). The individual media files that make up a podcast are often referred to as episodes. Additional episodes are added to a podcast overtime, just as shows are added to a radio program. Other terms for a podcast include "netcast" and "vodcast" (video). Do I have to subscribe to a podcast in order to listen to it? Do I need to have an iPod to listen to a podcast? What equipment do I need to listen to a podcast? What are some ways podcasts are used in education? What is the MC Podcast Directory? What is Montgomery College on iTunes U? Why list podcasts in multiple directories? What is the MC Podcast Builder? 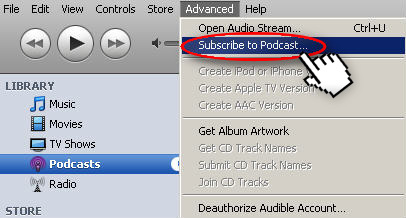 In order to subscribe to a podcast, you must first install a podcatcher (also known as a "podcast receiver") or a feed reader on your computer. iTunes is a commonly used podcatcher. Internet Explorer 7 has a built-in feed reader. Note: The advantage of using a podcatcher is that it can be configured to automatically download new podcast episodes and facilitate the process of transferring those audio and video files to a portable device like an iPod. A feed reader displays new podcast content, but does not automatically download it for you. From the Search Results page, right-click the orange RSS icon and select Copy Shortcut. This will copy the Web address to the RSS feed. In iTunes, go to the Advanced menu and click Subscribe to Podcast. Paste the Web address to the RSS feed in the Subscribe to Podcast dialog box and click OK.
No, you do not have to subscribe to a podcast to listen to individual episodes. All podcasts publically listed in the MC Podcast Directory are made available on a Web page for playback so that you do not have to subscribe to them. You can visit the MC Podcast Directory to search for a podcast and then play individual audio/video files by using the playback controls provided (or by downloading the files to your computer). No, you do not need an iPod or any portable digital audio/video player to listen to a podcast. You can play individual podcast episodes directly from your desktop computer. The advantage to having a portable digital audio/video player, though, is that you can listen to a podcast from any location. What equipment do I need to listen to/watch a podcast? To listen to/watch a podcast without subscribing to it, you will first need to download the Flash player (free), if it is not already installed on your computer. Make sure your computer's speakers are turned on and the volume control is set to an audible level. To check the audio settings on your PC, go to the Control Panel and click the Sounds and Devices icon. On the Volume tab, adjust the volume for your speakers. If you wish to listen using ear buds, ear phones, or a headset, plug your device of choice into your computer's USB drive or earphone input jack. Headsets and ear buds may be available for purchase at the campus bookstore, MC Books & More. Podcasts can be used to facilitate various types of learning - analytical, procedural, factual, language-related, etc. They can be used in various learning environments: on-campus (face-to-face), blended, and online classes. News podcasts report on current and upcoming events on campus and in the community. Audio-guided tutorial podcasts walk learners through a series of activities and content. Lecture podcasts are recordings of facilitator-led, direct instruction (with or without a live audience). Lectures are recorded and saved for students to refer to at any time. Chapter markers are often added to help divide the content up into distinct sections by topic. Interview podcasts are recordings of informal and/or formal meetings with content experts and special guests. Virtual field trip podcasts are audio/video journals of an individual or group's experiences visiting a new location. The audio/video contains sounds of the experience and narratives. Demonstration podcasts illustrate a procedure. They may contain videos of computer screen motion - what is happening on the screen and how the computer responds. An example is a podcast on how to search for library resources or how to use software such as Microsoft Office. The general public can search and browse the MC Podcast Directory for MC-related podcasts. The directory lists MC-related podcasts created by faculty and staff (podcasts marked as "hidden" by their owners are not listed, but may be made available to a target audience through a direct link provided by the owner of the podcast). From the MC Podcast Directory, you can subscribe to podcasts using any feed reader or podcatcher. Or, you can play individual audio/video files by using the playback controls provided (or by downloading the files to your computer). Montgomery College on iTunes U is not yet live. Montgomery College has chosen to use Montgomery College on iTunes U as a directory of MC-related podcasts, like the MC Podcasting Directory. By using Montgomery College on iTunes U, you are using iTunes as your podcatcher. Although iTunes U does have an interface for podcast owners (MC faculty and staff) to upload individual audio/video files to Montgomery College on iTunes U, a decision was made not to use that function, as the MC Podcast Builder streamlines this procedure for us. Podcast owners may choose to list their podcasts in multiple directories (MC Podcast Directory, Montgomery College on iTunes U, and others) to more widely advertise their podcasts. Montgomery College on iTunes U (not yet live) is a small segment of the entire iTunes U directory, which lists podcasts from various educational institutions. Many people around the world use iTunes U to find education-related podcasts, including MC podcasts. Although the MC Podcast Directory is not as widely known, it is a valuable tool for subscribing to a podcast using your choice of a feed reader or podcatcher (you are not limited to using only the iTunes podcatcher with the MC Podcast Directory). The MC Podcast Directory also makes it easy to play audio/video files using playback controls (or directly download them to your computer). The primary purpose of the MC Podcast Builder is to make it easy for MC faculty and staff to store audio/video files that they create and want to make into a podcast. They can use the MC Podcast Builder to make a number of podcasts and to generate an RSS feed for each (the RSS feed is what enables users to subscribe to a podcast). 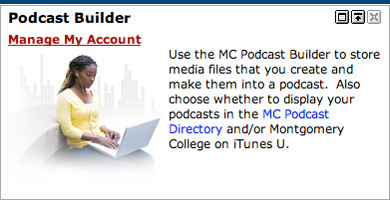 MC faculty and staff can use the MC Podcast Builder to submit their podcasts for display in the MC Podcast Directory and/or Montgomery College on iTunes U (not live yet). The MC Podcast Builder does not create the audio/video files. Students can make their own audio/video files as part of a project, submit them to their instructor, and using the MC Podcast Builder, the instructor can post them as part of a course podcast. You can create your own audio/video files for your podcast using the recommended equipment and software or your choice of tools. See the About page for information on hardware and software, as well as support and training opportunities. Students creating audio/video files for a class project should contact their instructor for tools, assistance and training. To gain access to the MC Podcast Builder, locate the Podcast Builder channel on MyMC , Montgomery College's secure portal (if you do not see this channel, email podcast@montgomerycollege.edu for assistance). Click the Manage My Account link and complete the required fields to request an account. When you receive an email (in your Montgomery College email inbox) notifying you that your account has been activated, you can begin to use the MC Podcast Builder. You need at least one audio/video file to begin making your first podcast on the MC Podcast Builder.